This Saturday, the United States Marine Corps will celebrate its 237th birthday. The Corps of today traces its history to 1775, when the first Marines were raised for Continental service at the beginning of the American Revolution. The regiment of sea-going soldiers disbanded at the end of the war in 1783. If you’d asked an American in the early nineteenth century about the history of the Marines, they’d have told you that they owed their existence to the “Act for Establishing a Marine Corps” of July 11, 1798. The legislation establishing the Marines was one of several passed by Congress as the United States augmented its military for a conflict with the French Republic (the so-called Quasi War). In reality, the War Department had been recruiting men to serve as Marines to guard the newly-built warships since at least 1797. Most recruiting officers had considerable trouble filling their quotas, however. After all, the government offered only six dollars per month, and no recruiting bounty. An able seaman made seventeen dollars per month at this period, and a diligent laborer on shore could make almost double that. 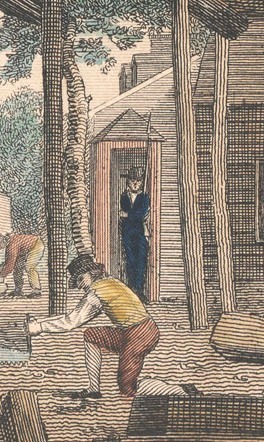 Detail from Preparations to Defend Commerce, by William Birch, 1800. One of the few contemporary images to depict a Marine, this print features a private “supporting arms” in a sentry box at Joshua Humphreys’ Philadelphia shipyard. USS Constitution Museum collection. reproaches of contemptuous sailors, Marines began to desert the service in large numbers. and clasp. Said deserter lately came from Packquarry, Wayne county, Pennsylvania, was lately confined in Easton goal for stealing, &c., and has been accustomed to navigate the Delaware between Philadelphia and Easton, in boats and rafts. Whoever apprehends this deserter and confines him in any goal, or will deliver him to me at Trenton, shall receive the above reward, and all reasonable charges. flogging he got a few days ago. He may be discovered by his fifeing, as he plays extremely well. Why he ran off the first time we can’t know, but evidentally the flogging he received for deserting hardened his mind against Burrows and the Corps. Most organizations have rocky beginnings. It is no wonder that the Marine Corps’ first motto was Fortitudine– Latin for “fortitude.” It would take a few generations and a few more conflicts before the USMC gained a reputation as a world-class, first-rate fighting force. The Daily Advertiser (New York), 13 Nov. 1798. Spectator (New York), 27 Mar. 1799. Claypoole’s American Daily Advertiser (Philadelphia), 27 May 1799. Gazette of the United States (Philadelphia), 26 Dec. 1798.